UK annuities could fall as gilt yields are 18 basis points lower this month and unlikely to recover following an ECB statement that it required stimulus to continue to raise inflation in the eurozone. UK annuities are based primarily on the 15-year gilt yields and an 18 basis point decrease this month would mean we can expect a 1.8% fall in rates. Investors were disappointed with the European Central Bank (ECB) President Mario Draghi statement that interest rates would remain unchanged but in particular that the low inflation rate would mean the stimulus measures would remain. The ECB's quantitative easing programme of buys bonds increases the price and reduces the yield which has an impact on bonds and gilts in the UK and US. In October 2017 the ECB reduced the buying to 30 billion euros per down from 60 billion euros starting in January 2018 with the intention of stopping completely from September next year, however, but this may now be extended. Standard annuity rates for people in good health are now at a high for the year with increased competition from leading providers such as Aviva, Canada Life and Legal & General. 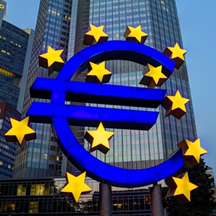 Investors had anticipated that the €1.1 trillion quantitative easing (QE) programme could stopped and this action would mean the end of bond buying from the ECB sending the price lower and yields higher with improved annuity rates in the future. However, with inflation expected to be only 1.5% in 2017 the ECB intend to continue with the stimulus to boost inflation in the medium term. Our benchmark annuity rate (see table above and chart below) is for a 65 year old buying a single life, level annuity with a fund of £100,000. The income in April 2017 was the lowest of the year at £5,108 pa and this has increased by 7.7% to £5,503 pa. This compares to the 15-year gilt yield which are almost unchanged reducing slightly from 1.46% to 1.45% suggesting rates may be set for a decrease. 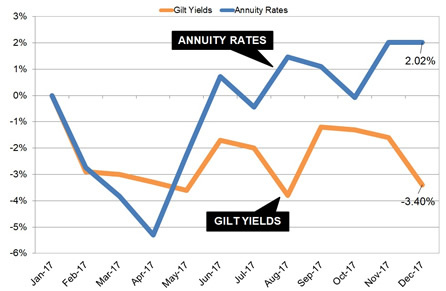 The above chart shows that providers have resisted lowering rates since May 2017 when annuities and gilt yields have diverged over the short to medium term. A correction of -5.42% in annuity rates would be needed to converge the above chart although it is likely the providers would decrease rates gradually over the medium term. 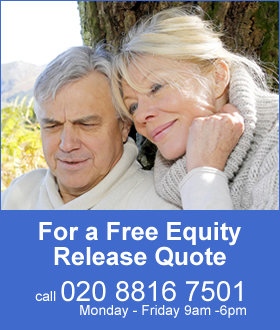 Currently the high December rates compared to the April figures for our benchmark example would result in £485 pa more income from an annuity. In terms of lifetime income, the Office of National Statistics (ONS) would expect a male to live for 17.3 years and he will have £8,390 less over his lifetime. For a female she can expected to live for 20.4 years decreasing her lifetime income by £9,894. For those planning to take their benefits as an annuity this could be the better time rather than risk a fall in annuity rates at the beginning of 2018.